All Models - Gill Drilling Services INC. The Gill Beetle® is the new millennium drill. The Gill Beetle® Quarry Drill’s sturdy construction and simple design make it both durable and practical for any drilling need. The Gill Beetle® Drill is extremely stable on uneven ground and provides maximum maneuverability over the toughest terrain. The 975cfm / 363psi air capacity makes the Gill Beetle® a high production drill. The Gill Beetle® Drill can put the hole where you want it, quickly and efficiently, without leveling jacks or major site preparation. The optional operator cab allows the driller to work in a quiet, climate controlled environment. The operator cab meets MSHA noise reduction standards and is designed to comply with ROPS/FOPS standards. As a full service manufacturer, Gill Drilling Services / Gill Rock Drill Company can provide you with any training and technical support you may require. The Gill Beetle® Construction Drill's compact dimensions, heavy duty track crawlers, and separate air compressor allow access to almost any drilling project whether it involves rough terrain, low height restrictions, narrow passages, small enclosures, or even floating on the water. The Gill Beetle® Drill is capable of drilling holes 4 to 24 inches in diameter making it adaptable for many different hole size requirements on the same job. 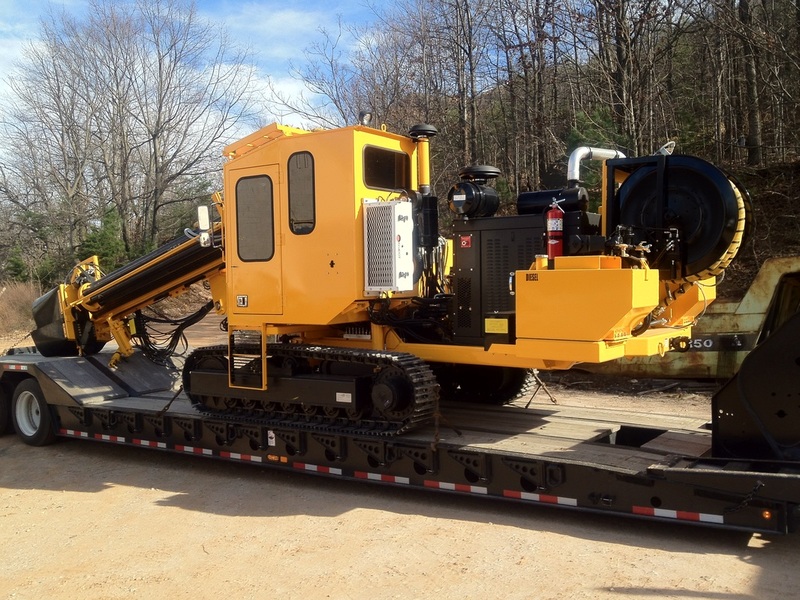 The Gill Beetle® Drill is easily transportable by truck, airplane, crane, or barge. "Low initial capital investment combined with low repair and maintenance costs means lower operational costs." are all examples of jobs handled by the Gill Beetle® Drill. The Gill Beetle® Drill’s ability to drill up to 500 feet in tight or difficult to reach areas makes it ideal for geothermal well installation. The Gill Beetle® Drill can be adapted to hold ten 3”x10’ or 3”x12’ drill pipe in the carrousel giving you 100’ to 120’ of drilling capacity before adding any extra pipe. Gill Drilling Services / Gill Rock Drill Company manufactures lightweight aluminum drill pipe that makes drilling deeper easier. A pipe clamping system for casing holes can be added. The clamping system can hold casing up to 6” in diameter. The mast on a geothermal drilling designed Gill Beetle® Drill is constructed to a proper length so that a discharge head can be used above the drill pipe.